I begin this review by excerpting the blurb from the back cover of A Lady of Fortune because it captures the spirit of the heroine, the orphaned heiress Harriet Ashley. Previously plump, plain (aside from her gorgeous long red hair, of course), and recovering from a bout of consumption that has left her rail-thin, Harriet knows that all twenty men who have proposed to her have looked at marriage merely as a business transaction. But Harriet wants something more, so she comes up with an outrageous scheme to get her way. Meanwhile, Harriet’s guardians are sick and tired of her refusing every eligible, titled bachelor they steer her way. Therefore, Harriet is able to convince her most sympathetic ally, Sir Benjamin, to accept a wager: if Harriet proves she can live for three months away from the luxuries of home on a shopgirl’s income, she will be permitted to marry the man of her choice–even if he is poor or lacks a title. Of course, no one believes that Harriet will be able to withstand poverty and the lack of society. But then, no one realizes just how stubborn Harriet can be. As the Luddite riots over the mechanization of industries smoulder, Harriet embarks on an adventure. Or, one might say, an anti-adventure, for her newly-straightened circumstances keep her confined to penny-pinching and socializing with the other tenants in her humble new home. One is the intriguing, well-travelled, and obsessive John Bellingham. The other is the charming and gallant William Grey, who spends his evenings “hunting” high-society to find a wealthy wife. Both men have their attractions, and Harriet’s heart is set on finding love and winning her wager. However, a series of unforeseen events trigger a political upheaval with Harriet at its center. These developments make her see her neighbors in a new light while bringing her close to ruin. First, Harriet Ashley is a compelling heroine, although I highly doubt any Regency-era heiress, no matter how stubborn, could convince her guardians to allow her to embark on such a wager. Nevermind that, though. The setup makes for a good story. Second, I commend author Blanche Chenier for giving Harriet a female friend–Sophia–who has some substance. Although her appearances are brief and we learn little about her personal life, at least she and Harriet have conversations that revolve around topics besides men and parties. Third, Chenier deftly handles the development of Mr. Grey and Mr. Bellingham, including their relationships with the heroine, each other, and their landlady, a widowed single mother named Mrs. Roberts. Perhaps the greatest strength of A Lady of Fortune is also its greatest drawback. Because Harriet must live on a shopgirl’s income, cannot work, and must carefully conceal her true identity, she is confined to the rooms she has rented from Mrs. Roberts except for grocery shopping and an occasional outing. Although the political intrigue subplot does shake up Harriet’s life, the book’s conceit means that after her first grand gesture, the brave and daring Harriet is hobbled. For a good part of the novel, she becomes a passive observer of the world around her. 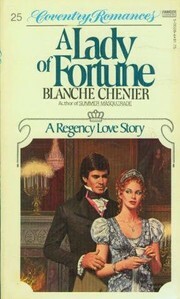 Despite the threat of stagnation, I found Chenier’s book engaging and enjoyable. While not very plausible, reading about Harriet’s wager is definitely pleasurable. And in the end, that’s what counts, right?